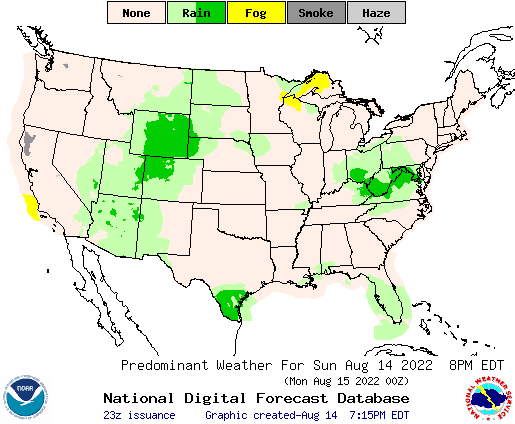 These 7-day forecasts come from the National Weather Service's National Digital Forecast Database (NDFD). Most of the 7-day forecast elements are at 3 hour intervals, and are image representations of the NWS worded forecasts made by NWS weather forecasters after they have examined computer model forecasts. The forecast fields include: (1) Predominant weather type (seen above); (2) Precipitation probability; (3) Daily high temperature; (4) Daily low temperature; (5) Wind speed and direction; (6) Relative humidity; and (7) Snowfall amounts. Move your mouse over the blue bar to change forecast times.